Boiled White Coconut Rice takes the basic Boiled White Rice to another level of taste. This recipe is special because it tastes great on its own without the need for a stew or sauce. But you can serve it with the following stews and sauces: Coconut Curry Sauce, Mixed Vegetables Curry Sauce or Nigerian Beef and Chicken Stew. 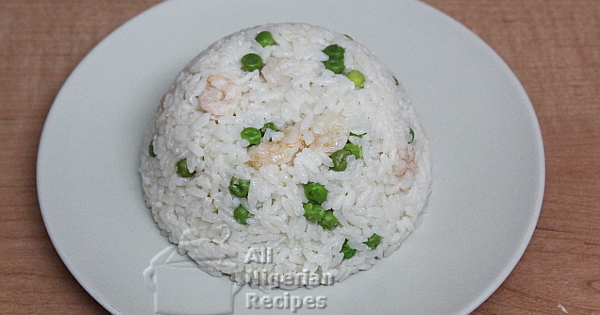 You can use another type of rice to prepare this but the process of precooking the rice detailed on this page may not apply to other types of rice. Use very mature, sweet coconut. You can add more shrimps and green peas if you wish. You can use tinned coconut milk to prepare this rice but I do not recommend it because tinned coconut milk is tasteless. For a rich taste, use tasty Homemade Coconut Milk. Use the coconut to make some fresh Coconut Milk. Click here for details. Set some water in a pot to boil. We will use it to preecook the rice. When it boils, add the rice and cook on medium heat for about 10 minutes. Pour it out in a sieve to drain then quickly cool it down with water. Pour the coconut milk in a clean pot and set it on the stove to boil. When it boils, add the precooked rice stir and make sure the coconut milk is at the same level as the rice. If not top it up with water. See the video below. Add salt and the shrimps. When the liquid is almost dry, add the green peas and continue cooking. When all the liquid dries up, the rice should be down. That is if you precooked the rice correctly. Enjoy it on its own or eat it with a stew or sauce: Coconut Curry Sauce, Mixed Vegetables Curry Sauce or Nigerian Beef and Chicken Stew.